Next time you pick some up, try it on a bagel or toast as a healthier cream cheese alternative! The yogurt has a creamy texture with some tang. You’ll be sure to love it ... and avoid high amounts of fat and preservatives. Win win! A study from Andrade et al in 2012  found that inter-meal water consumption improved satiety ratings when eating speed was controlled. What this means is that people felt fuller during and after a meal when they drank water with it. This could be beneficial for a dieter trying to lose body fat. Drinking water could potentially help with satiety during the meal and later in the day as well, making someone feel fuller, thus, decreasing their overall calories. This study also showed that slowing down and chewing your food fully helped as well. Our recommendation: Eat slowly, enjoy your meal, and drink Simpson Spring water with it! A practical recommendation could be to drink water 15-30 minutes prior to a meal and sip on water during a meal. While calories are the most important factor to losing weight, manipulating your fluid levels could trick you into eating less overall calories. When Chemistry was a rather new field, Fred Howard created some of our soda flavors that we still use today. 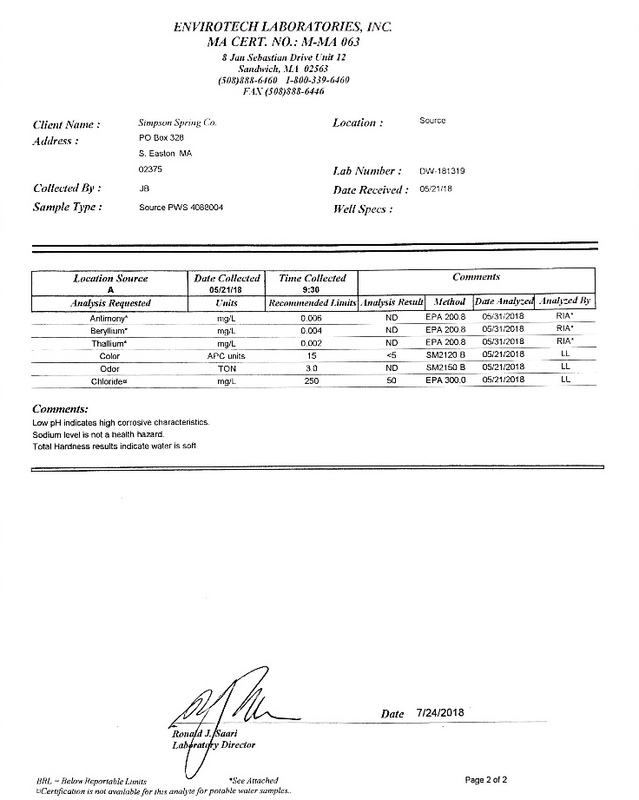 Here is our lab test for our water in 2018. This is a yearly test to show the mineral content in our water. Our water is third party tested twice weekly, and tested in house twice daily. Granulated Honey: What Causes Honey To Crystallize? The honey bee collects pollen and nectar from many different plant sources. Nectar contains a high percentage of water which the bees evaporate in the process of making honey. Honey is composed of dextrose, levulose, water 92%, the other 8% , various sugars.... When honey contains high levels of dextrose, it will granulate more quickly. The temperature of the honey will also effect crystallization. That can cause problems for winter storage if you are a beekeeper and plan to sell honey throughout the winter. If you have ever tried to bottle crystallized honey, you'd know, it's difficult. After harvesting our honey it is put into our bottling tank which keeps the honey just warm enough to prevent crystallization. We never filter our honey, and the temperature is never any higher than it would be if it were in a bee hive on a summer day. This makes our job a little easier and keeps our customers happy and sweet throughout the winter months. at the Simpson Spring Marketplace. DISCUSSION & BOOK SIGNING EVENT with 3 BEST SELLING AUTHORS! Local celebrity authors Doug "VB" Goudie, Michelle McPhee, and Anthony Amore will be here for a book signing and discussion. ANTHONY AMORE, author of Stealing Rembrandts, is the Director of Security & Chief Investigator at the Isabella Stewart Gardner Museum, where he is charged with the ongoing efforts to recover thirteen works of art stolen from the museum on March 18, 1990. A columnist & lecturer, he also provides analysis on issues related to security and terrorism for a number local and national news outlets. MICHELE McPHEE, author of Maximum Harm, is an Emmy-nominated investigative journalist, and award-winning columnist. A veteran investigative journalist, Michele is the best-selling author of six true crime titles. She is a Boston based investigative producer for the ABC News Ross Investigative Unit and a contribtor to Newsweek, Boston and other national magazines. DOUG ‘VB’ GOUDIE is a WRKO Morning Show Host, and author of ACK in Ashes, a novel about Nantucket’s Great Fire of 1846. This book tells the story of that fateful fire, and it also tells the stories of many of the men who would help see the island through its devastation. OK, so this isn't cooking with soda, but we have several FANTASTIC jams and jellies available in the Simpson Spring company store and even more options for locally sourced meats to brush these glazes onto - such as Featherbrook Farm Chicken or Blackbird Farm. Try this recipe with your favorite jelly or jam - we suggest Sidehill Farms, Bonnie's Jams or Sprig. Preheat and clean the grill. Oil the grates. Mix 1 tablespoon of olive oil and 1/2 of your jam together. Brush the chicken with the remaining olive oil and season with salt and pepper. Place chicken on gas grill over medium heat. Cook covered 8 to 12 minutes or until juice is clear when center of thickest part is cut (180°F), turning once and brushing with jam mixture during last 2 minutes of cooking time. Serve with the remaining jam on the side for extra dipping! You'd be hard-pressed to find a bigger supporter of local business than Laurie Hepworth, the innovative publisher of edible South Shore & South Coast. We always love when we get to work with Laurie and were happy to have had a minute to ask her a few quick questions about edible South Shore and where she likes to shop. LAURIE: Blood, sweat, and beers! There are a lot of big fans of eSS out there. Can you tell us one thing your readers might not know about the publication? LAURIE: We test and eat every recipe. No photo tricks are used. What we shoot (with the camera), we eat. Can you describe edible South Shore & South Coast in just three words? Do you, personally, shop local? Where do you like to shop? LAURIE: Yes, as often as we possibly can. You’ll find us enjoying locally owned grocery stores, restaurants, bookstores, garden centers, breweries, and wineries.